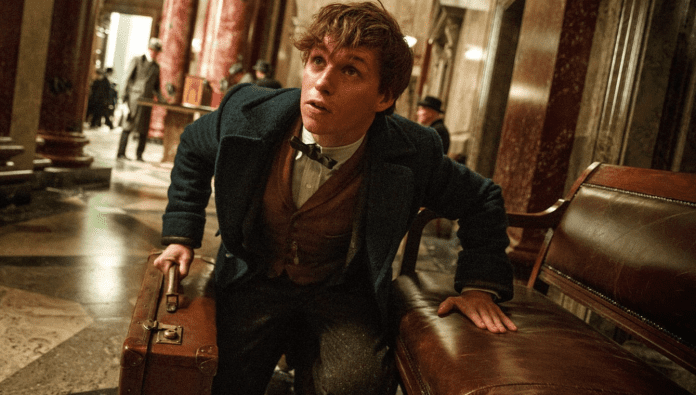 Eddie Redmayne stars in Fantastic Beasts and Where to Find Them. It’s New York harbor in 1926, which is when we are introduced to Newt Scamander (Eddie Redmayne) as he disembarks a steamship from England that’s just docked at the pier. The young wizard has to resort to a sleight of hand to slip through customs, since his suitcase is filled to the point of bursting with a unique brand of contraband. Newt happens to be hiding a menagerie of mythical creatures with unusual names like obscurials, bowtruckles and dougals. Given the unreliable latch on his tattered, leather satchel, it doesn’t take long for a mischievous niffler to escape. We soon observe the odd-looking critter breaking into a bank vault where it proceeds to indulge its insatiable appetite for gold by stuffing its pouch with glittery coins. Newt, however, must get it right back under wraps ASAP, before it arouses the suspicion of Mary Lou Barebone (Samantha Morton). She’s the leader of the New Salem Philanthropic Society, a group of no-majs, aka muggles (meaning ordinary human beings), dedicated to the extermination of wizards and witches. But Jacob not only flees before being “obliviated,” he inadvertently takes Newt’s bag of tricks with him to boot. Next, Tina Goldstein (Katherine Waterston), a comely witch with the Magical Congress of the United States of America, comes to Newt’s rescue. Thus unfolds Fantastic Beasts and Where to Find Them, a visually-captivating adaptation of the J.K. Rowling best seller of the same name. Although the book was alluded to in Harry Potter and the Sorcerer’s Stone, one need not be familiar with the Potter series at all to appreciate this delightful debut of a fantasy franchise designed for five episodes. Oscar-winner Eddie Redmayne (for The Theory of Everything) delivers afresh conveying an endearing vulnerability as the picture’s bashful protagonist. And he is ably assisted in this endeavor by a stellar supporting cast composed of both A-list actors and an array of computer-generated creatures. Redmayne’s enviable acting range makes Newt Scamander a far more engaging and emotionally- accessible character than Harry Potter ever was. Heavens to Hogwarts!